Kevin Stefanski navigated his introductory press conference three weeks ago like a veteran politician and not the first-time Vikings offensive coordinator. But the 36-year-old Stefanski did shed a little light on the team’s thinking while embarking on the NFL offseason that officially started Monday. One thing the coaching staff will consider this spring is moving left tackle Riley Reiff to a different spot, possibly to guard, according to a source familiar with the team’s thinking. Time will tell as the Vikings take an open approach to repairing the offensive line through free agency in March and the NFL Draft in April. First, the Vikings coaching staff needs to work out the contractual kinks in the addition of Rick Dennison as offensive line coach and run game coordinator. Dennison, 60, is a longtime assistant of Gary Kubiak’s, serving as his offensive coordinator in Houston and Denver. He’s been their target since hiring Kubiak as assistant head coach last month. Reiff, 30, had a poor second season in Minnesota plagued by a foot injury he played through during the first half of the schedule. The team captain and Kirk Cousins’ backside protector surrendered strip-sacks in back-to-back weeks against the Bills and Rams, saying “I need to play better” in between the two. The popular grading site Pro Football Focus pegged Reiff with 42 pressures allowed, the eighth most among all tackles, while a pass-happy offense was consistently limited by pass rushes. The Vikings could start two new guards in 2019 with Tom Compton and Nick Easton, recovering from neck surgery, on expiring contracts. Right guard Mike Remmers’ contract, with no guaranteed money left and a $1.8 million cap charge if cut, also becomes expendable in March. 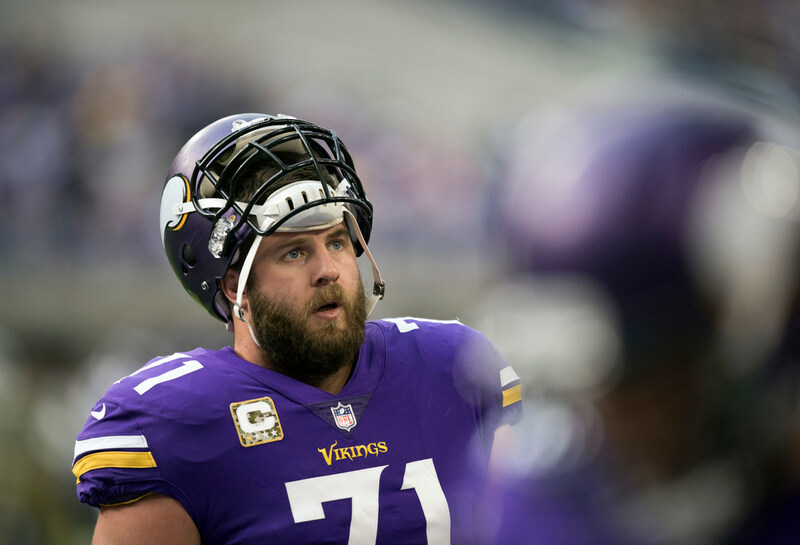 The Vikings signed Reiff two years ago to be the left tackle on a five-year, $58.75 million contract after missing on Andrew Whitworth and Russell Okung in free agency. Reiff has started 93 games at left tackle since he was drafted in 2012’s first round by the Lions.